Today, organizations are finding that storing and processing their data in the cloud brings countless benefits. However, without the right tools (such as cloud access security brokers (CASBs), they can put themselves at risk. Organizations’ IT departments understand how vital cybersecurity is, but must be equipped with modern tools in order to secure their data. CASBs protect against a wide range of security concerns that enterprises face when migrating to the cloud. Consequently, they have quickly increased in popularity and have become a one-stop-shop for countless enterprise security needs. Depending on the industry in which an organization operates, it may need to focus on security for managed devices, or perhaps it might need more of a bring your own device (BYOD) solution. While major SaaS applications improve organizational productivity and flexibility, they can serve as entry points for malicious threats such as malware or be used to share sensitive data with unauthorized parties. In infrastructure-as-a-service platforms, even a simple misconfiguration can cause data leakage and jeopardize an organization’s wellbeing. Without a solution designed to address these modern security concerns, organizations can fall victim to these and other threats. In recent years, cloud access security brokers have been used to prevent these types of unfortunate scenarios from happening to organizations. Whether it’s securing data on personal devices, limiting external sharing, stopping cloud malware, or other security needs, CASBs have been stepping in and protecting data whether it is in transit or at rest. In our latest white paper, Top CASB Use Cases, we go into detail about how organizations have used cloud access security brokers to embrace both the cloud and BYOD without compromising on security. For information about how CASBs help secure data, download the Top CASB Use Cases. Data breaches have been a significant topic for organizations in the past few years, but this latest data breach in particular, emphasizes the importance of proper cybersecurity. This monumental breach revealed 772,904,991 unique email addresses and over 21 million unique passwords. This immense volume of credentials was posted to a hacking forum just two weeks into the new year. A cybersecurity researcher by the name of Greg Pollock found 3 terabytes of unprotected data from the Oklahoma Securities Commission. This included sensitive FBI data, including files whose creation dated back to 2012. Social Security numbers were also found, some of which were collected as far back as the1980s. The FBI has not confirmed or denied the data breach but, according to UpGuard, the cybersecurity firm investigating, this data breach is significant and affects the entire agency statewide. Voipo, a California communications provider, left a database full of text messages and call logs completely exposed. A cybersecurity researcher found this unprotected server with 6 million text messages and 8 million call logs. The data also included documents with encryptedpasswords that would put the company at risk if accessed by a malicious user. Data on weapons and munitions acquisitions were exposed when a South Korean government agency’s computer systems were breached. This data included military weapons such as concepts of fighter aircrafts. The attackers were able to hack into an unsecured server for a program that is present on all government computers. The South Korean National Intelligence Service investigated the data breach and, although they have disclosed the occurrence to the public, they have not announced whether or not they’ve discovered the identity of the hackers. Del Rio City Hall servers were shut down after a ransomware attack. The Management Information Systems (MIS) department had no choice but to stop all devices from connecting to the internet to halt the spread of the malware. With no access to data online, employees of each department were then forced to use pen and paper for all of their daily operations. City Hall officials have reported the incident to the FBI but it is still unclear whether or not data has been compromised or who was behind the attack. To learn about cloud access security brokers (CASBs) and how they can protect your enterprise from ransomware, data leakage, misconfigurations, and more, download the Definitive Guide to CASBs. Financial services organizations are a prime target for hackers looking to steal and sell valuable data. This is because these firms handle sensitive information known as PII, personally identifiable information, as well as other financial data. In Financial World: Breach Kingdom, Bitglass’ latest financial breach report, the Next-Gen CASB reveals information about the state of security for financial services in 2018. Read on to learn more. 2018 has seen the number of financial services breaches reach new heights. This is likely due to a large number of reasons. For example, some organizations may have an overreliance upon existing cybersecurity infrastructure and find it difficult to justify additional expenses in light of their existing sunk costs in security. Other firms may simply overestimate what traditional endpoint and premises-based tools can do to protect data from evolving threats. Regardless, the fact remains that financial services firms were breached in 2018 nearly three times more than they were in Bitglass’ previous, 2016 report. In prior years, the causes of financial services breaches were fairly diverse. Lost or stolen devices and hacking each caused about 20 percent of breaches, while unintended disclosures and malicious insiders were responsible for 14 percent and 13 percent, respectively. However, this year saw a massive shift in the balance of power. Nearly three quarters of all financial services breaches in 2018 were caused by malware or hacking. This seems consistent with headlines over the last year – ransomware, cloud cryptojacking, and highly specialized malware variants have dominated the news when it comes to breaches. In financial services, far more must be done to secure sensitive information. While it is imperative that the enterprise can protect data against any threat, it is now clear that defending against malware deserves special attention. This is particularly true in light of the rise of cloud and BYOD. More devices and applications are storing and processing data than ever before, creating more opportunities for malware to infect the enterprise. Fortunately, there are appropriate solutions available. To learn more about the state of cybersecurity in financial services, download Financial World: Breach Kingdom. Pwned Passwords – Have Your Credentials Been Stolen? Data breaches now seem to be a daily occurrence. In recent months, Have I Been Pwned (HIBP) introduced Pwned Passwords, which allows you to securely check your password against a database of breach data. There are over 280 breaches in the database, and that’s only the tip of the iceberg. Breaches aren’t just a problem for the users who lose their data, but for the companies responsible for it. So how does all this data get breached? Surely, it was some sinister character in a hoodie with extensive knowledge of computers, right? As it turns out, many of the data breaches came from misconfigured databases and Amazon S3 buckets that were left wide open for anyone who knows where to look. S3 is easy to use, which is great for security-conscious developers. However, it also makes it easy for someone who doesn’t understand security to toss some data into the cloud (so that it’s publicly viewable) and forget about it. As noted by Troy Hunt, the security researcher who runs HIBP, one company was breached because it stored personal data from IoT devices in MongoDB and Amazon S3 buckets with no credentials. It’s not just small, unorganized companies that make these mistakes either. Big corporations are losing track of their configurations, too. Proper training is a good way to help with these problems, but it’s not always enough. Fortunately, a cloud access security broker (CASB) can help keep S3 and other cloud data secure by encrypting the data at rest. That way, even if data can be accessed by unauthorized parties, it is still unreadable and protected. A CASB can also provide auditing and analytics tools to help detect suspicious activity so that data breaches can be detected early as well as prevented from happening in the first place. It wasn’t long ago that the first breach under the Office of the Australian Information Commissioner’s (OAIC) Privacy Amendment Bill was made public. Now, OAIC is back with their first Quarterly Statistics Report of Notifiable Data Breaches. While the report doesn’t offer much in the way of detail, it does highlight a couple of interesting trends. 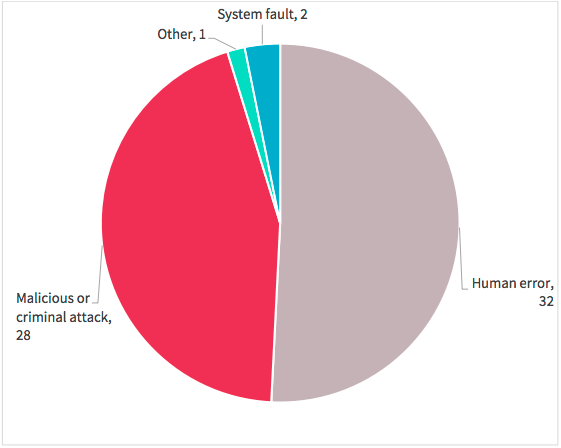 The statistic that jumps out most is that of the 63 reported breaches in this first (partial) quarter, the majority (51%) were the result of “human error.” According to OAIC, “human error may include inadvertent disclosures, such as by sending a document containing personal information to the incorrect recipient.” Sounds like too few Australian organizations are controlling things like external sharing, even though sharing (and many other potentially risky activities) can be controlled quite easily with a Cloud Access Security Broker (CASB). 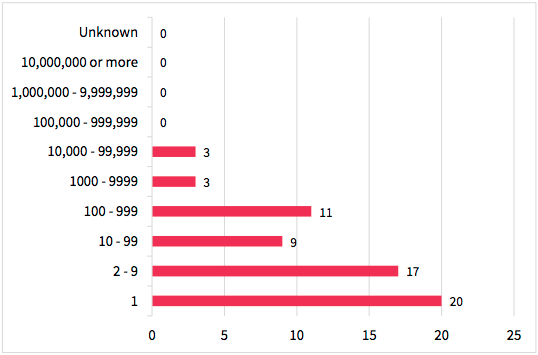 The report also breaks down number of breaches by industry. Health service provides had the misfortune of leading the charge in this initial quarter, representing nearly a quarter of breaches. Healthcare organizations have a particularly difficult task with data protection. On one hand, they have a very mobile workforce that requires immediate access to data, from anywhere and from any device. On the other hand, medical records are some of the most valuable sources of personal data, including not only medical history, but personal information, financial information, and more. Fortunately, this first quarter didn’t include any large, “mega-breaches,” as more than half involved the personal information of fewer than 10 individuals, and 73% involving fewer than 100 individuals. It will be interesting to see whether schemes like this, and the upcoming GDPR, have an impact on overall data protection outcomes.